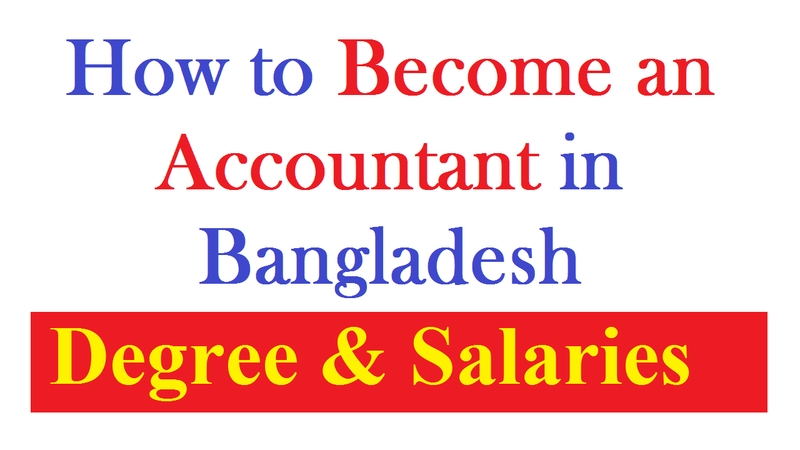 If you’re looking for how to become an accountant in Bangladesh then you should read the entire content for the full information from degree to salaries. There are some other jobs those are as same as the accountant job, including International Financial Reporting Standard (IFRS), Tax or Accounting, Chief Financial Officer (CFO), Finance Director (FD) etc. Also, those all are the part of the CA (Chartered Accountant). And we’re sure that you should have heard that CA professionals are well paid and they get a car and draw monthly six digits salary. Moreover, the job of a CA starts at the managerial post from the first day of the job. These all are attracting you to become an accountant in Bangladesh, right? So, you should know all in details before jumping over to be an accountant. Although, it’s now discussed at various economic seminars, capital markets, investments, and such other forums, in the twenty-first-century accountant, especially Chartered Accountant (CA) has emerged as a unique profession of paramount importance. And apart from accounting, taxation, and financial management, innovative financial instruments are being constantly introduced and the profession worldwide to cope with the increasing demand in the field of economy. In all sizes of accounting firm from sole practitioners to affiliates of large international firms Chartered Accountants are in public practice in today’s free globalize world. Usually, an accountant in Bangladesh gets $52,100 annually, which may range from $45,000 – $65, 957. Provided by employees or estimated based upon statistical methods, this estimate is based upon 4 Bangladeshi Accountants’ salary reports. An accountant in Bangladesh can expect to make an average total pay of $52,100 when factoring in bonuses and additional compensation. These additional factors are including Cash Bonus, Stock Bonus, Profit Sharing, Commission Sharing, etc. These salaries are basically for those who are CA, but some of Master of Commerce with honors degree holders also gets the similar amount when they are much experienced in their field. If you want to become an accountant in Bangladesh, you need advanced education, formal certification, and a firm commitment to learning the trade. And it’s notable that we’re talking about the highest degree in accounting, like CA. And the prospective accountants need to answer a number of questions along the way whether they possess the qualities needed to become an accountant or CPA etc. Those who are interested in a career as an accountant, this comprehensive guide are designed to be a resource for them. Well, let’s know the steps to become an accountant in Bangladesh. Most accountants attend college and earn a bachelor’s degree, it’s not required. But, the minimum education requirement for those who plan to become an accountant needs a bachelor’s degree in accounting or a related field. Beyond the normal bachelor’s degree in subjects such as financial reporting, taxes, auditing, and other non-accounting business areas are preferable for the job purpose. Also, it requires a total of 150 credit hours in accounting and related areas in common. The most demandable one is the CA and then Master of Commerce (M.Com.) while seeking a job in Bangladesh’s context. As there are two general areas of specialization are public accounting and corporate or business accounting, virtually all accountants specialize in one or more areas of practice. You should pick a special one from many, including internal auditing, environmental accounting, managerial accounting, and taxes. As there is a difference between an accountant and a Charter Accountant, accountants also referred to as public accountants are typically individuals hired to work in the accounting departments of businesses. But, the public accountants have lack of several qualifications of CA accountants. Along with earning a college degree, passing all parts of the CPA exam, and working for a set number of hours, a CA must meet a number of specific requirements. Although a CA can perform all of the same tasks as a public accountant, additionally may conduct audits, review statements, and represent clients. Candidates should pass all four parts of the CA exam to become a CA. During the first two months of every quarter, and typically over the course of several days, the CA exam is offered. Although candidates may take the test parts in any order they choose, once they have passed one part, they must successfully complete the other three parts within 18 months. As most CA test candidates enroll in private test preparation courses, its given degree of difficulty and breadth of subject matter. Try to get an accounting internship or find another way to get some experience to pump up your resume before you graduate. Creating a resume and sign up for a career-focused social media platform such as LinkedIn, take the necessary steps. It’s tempting to sit back and enjoy the ride after all the hard work of college when you land your first job. But, you’ll need to move up the career ladder when you should be thinking about the next moves. It’s something you may want to look at down the road if you haven’t earned your CA. Accountants and CAs keep and inspect financial accounts for companies, government groups and individual clients on the most basic level.